Sometimes we should remember the tragedy of the earthquake and tsunami and the nuclear meltdown of March 2011. Someone I know just got back from a moving visit to a small town in Fukushima where many people were swept out to sea in the tsunami. Many people supported Japan in the aftermath. I was impressed by Sandra Bullock immediately giving a million dollars. Somebody found that inside ASUS computers there was a message saying, God Bless Japan. 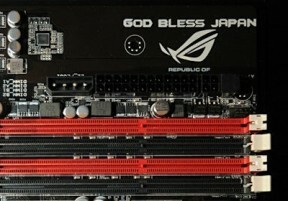 On the ASUS Danshui Bay Concept motherboards. A normal computer user would never see it. Only a computer engineer might find it. A quiet and classy message of support. A Soccer Game in Ukraine During World War II Echoes Through Time – NYTimes.com. German commentator: The crowd is going wild! I agree with you Niall and thank you for reminding us about the tragedy, but I think that it should not be necessary to remember an earthquake, tsunami or any other disaster to say God Bless Japan or God Bless Haiti, or God Bless Chile, when the miners were trapped more than two month underground, to be grateful for all what we have, how rich we are for have an healthy family and how wealthy we are for the nice friends, for the job we have, we should remain humble and take advantage of every moment and live it happy and as good as we can. By the way didn’t know about ASUS, looked in internet for it. So God Bless the world!